Proposed by the Hospitaller Order of St. John of God Brothers working in the Diocese of Makeni. As a congregation and with a mandate and contract with the Public to run a General Hospital in the Marampa Chiefdom, we resolved during the period of quarantine of the hospital to initiate a plan of activities to be carried out in the Chiefdom in order to break the chain of exponential transmission of the EBV disease, which at this time of September and October, 2014, the rate of new infections was extremely high in the Chiefdom. This forced our hospital to hesitate to re-open especially after when one of the Brothers, Dr. Manuel Garcia Viejo got himself infected on 11 September, and passed on 25th September, 2014 in Spain. After a collective analysis of the prevailing situation in the Chiefdom in a meeting held at the Chiefdom Health centre on 25th August, 2014(see minutes attached), the Brothers were invited to join the fight against EBV, hence we made the following plan of actions to the stakeholder within the chiefdom. And this plan fell in the pillars set up by the District Health Management Team of Port Loko District. The aim of this plan was to create a safe environment for the Hospital to offer Non- Ebola health services in the near future. To empower all the health workers within the chiefdom with Infection Prevention Skills in caring for sick persons in their communities. To engage the traditional authorities to own the preventive activities on EBV eradication. To increase the awareness of socio-economic impact of the spread of EBV within the community. Train all health works in the Marampa chiefdom (St. John of God Catholic Hospital, Baptist Eye Hospital, Konike Clinic, Lunsar Health Centre, 6 Primary Health Units, Arab Clinic. Identify volunteers to work in the observation centre. Identify an observation/a holding centre. Soliciting for support to provide a vehicle to transport suspected Ebola victims from PHU’s, homes to the Observation centre.  Councelling and breaking the news.  Provision of food and water. Plan for bereaved families of victims. Role played by: Brothers of St. HJohn of God through the St. John of God the St. John of God Catholic Hospital, Lunsar and St. John of God Community Health Centre, Lungi. The St. John of God Catholic hospital ceased to provide services to the Public from August 18th 2014 and September 22nd 2014. In the first instance, we disinfected and fumigated the entire hospital and replaced many infected equipment and materials, and all the mattresses, train our staff and the chiefdom staff on Infection Prevention and Control measures, distributed PPEs and cleaning materials to all health facilities in the chiefdom, etc. This took place from 18th August to 8th September, 2014. From 9th September, 2014 we opened the doors of the hospital to the General Public. This lasted for exactly 2 weeks when one of the Brothers of St. John of God, a medical doctor and veteran surgeon, key to the hospital got himself infected and eventually died in Spain. This sudden event scared us and made us shut down our doors again to the public realizing that there were some serious lapses in the hospital protocols especially during this period of outbreak. The lapses identified were no triage process and no standard Isolation unit to give care to Ebola suspects. So from September, 22nd, 2014 to date, the hospital ceased operations to the Public. However, during this period again, the hospital has not been silent, but for a period of two weeks, (1st October-15th October, 2014) the hospital organized an intensive 2 weeks training on Patient care management during an outbreak to all its staff. This included training on screening and triaging of patients visiting the hospital. From October 23rd to date, the hospital embarked on an outreach programme to offer food and other basic needs to quarantine families, giving them health education and monitoring their physical health and administering basic medical malaria treatment when necessary. We negotiated for transport for any suspect identified to Port Loko for further management. This centre is established by WHO and supported by the Port Loko District Health Management team. Because the President of the Republic placed much importance on the role the Brothers have started playing in the eradication process, he visited the Holding centre in the hospital, for the first time to see such a health facility in the District. His Excellency, Dr. Ernest Bai Koroma,(right) in a desperate mood chatting with Br. Michael(Left) Wanting to see things move fast for his people. After several negotiations and networking with authorities at the Ministry, and politicians, the Ministry of Health released an Ambulance and 2 burial vehicles to Marampa Chiefdom which the hospital has access to. The hospital also organized several engagement session with all the traditional leaders in the 146 villages in Marampa chiefdom to motivate them in joining the fight to eradicate ebola within the community. Currently, the Brothers are engaged in surveillance, social mobilization and Nutrition to Quarantine families, and treatment of minor ailment, monitoring and support to the holding centre in Marampa and Kaffu Bullom and provision of Non Ebola Medical services to the Public at the Out Patient department with a standard triaging post in the hospital. Ebola sensitisation and training of community health facilities on Infection, Prevention and Control measures. Location: Lunsar and Lungi chiefdom headquarter towns of Marampa and Kaffu Bullom respectively. Target: The Sierra Leone Police, Traditional Healers, Bike Riders, Drivers Union, Youth groups, Local Authorities, Religious groups, Traders and Market Women and health workers from both private and Govt institutions (350 participants). Donor: Manos Unidas, Spain / BCN School of Nursing, Spain / St. John of God Dev. Company, Ireland & Holland. Results: To prevent Ebola situations in all health facilities and stakeholder groups in the immediate communities surrounding the St John of God health facilities. The provision of IPC materials and training of the institution’s health staff. Target: All staff of the St John of God health facilities and other health facilities and Primary health Units. Donor: Cordaid, Netherland / GLOBAL LAB, Germany, BCN School of Nursing, Spain, Catalunian Governement, Spain / St. John of God Dev. Company, Ireland & Holland. Results: To create a situation where staff and patients of the St John Of God health facilities become free of the Ebola Virus Disease. 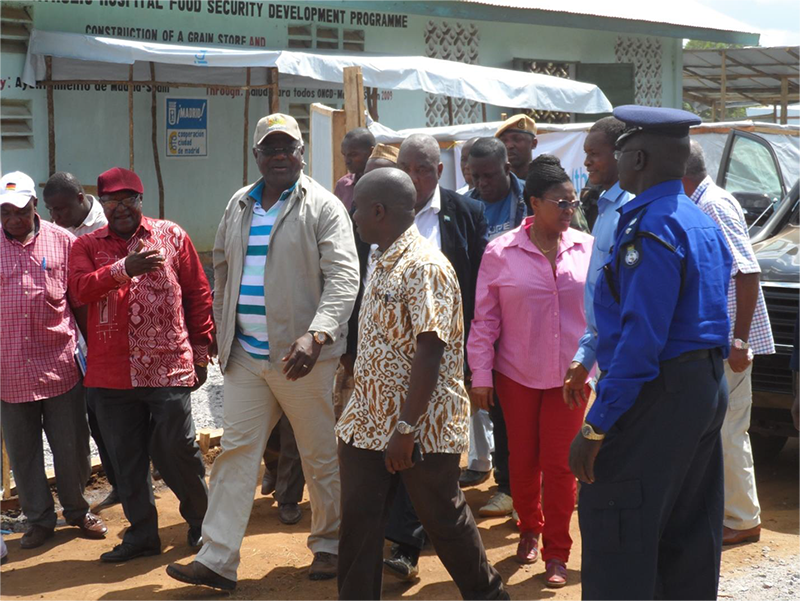 Community engagement on Ebola issues and addressing the welfare needs of quarantined homes. Target: 64 Quarantined homes of a total family membership of 465. Donor: Misean Cara- Ireland / St. John of God Brothers, St. John of God Dev. Company, Ireland & Holland. Results: To prevent Ebola transmission and further deaths in quarantined homes. Target: 81 Quarantined homes, 261 traditional heeads and villages. Target: 90 suspects and 27 staff. Donor: MISEA CARA-Ireland / St. John of God Brothers, Catalunian Governemnt, Spain / St. John of God Dev. Company, Ireland & Holland. Results: To motivate staff and encourage sick persons to report for early care. Re-opening of Health facilities providing Non Ebola services and Primary health Care to rural communities. Location: St. John of God Catholic Hospital and Clinic in Lunsar and Lungi respectively. Target: 16,000 non ebola suspects. Donor: St. John of God Brothers / Italian Cooperation, International Medical Corps, MISSIO AUSTRIA / ENGIM, MOHS-DHMT. Results: To reduce the morbity and moratlity rate during the EBV and post EBV era. Esta entrada fue publicada en Hermanos de San Juan de Dios, Hospital SJG Mabesseneh, Proyectos en general, Temas de salud y etiquetada ébola, epidemia, EVD, informe, Lungi, Lunsar, Mabesseneh, Makeni, proyectos, Saint John of God Catholic Hospital Mabesseneh por comunicaciohsjdbcn. Guarda enlace permanente.